"Hark! hark! The dogs do bark!" The Dachshund started by attacking the Belgian Griffon, as being the smallest, and mauled the poor creature cruelly, but was quite unable to kill her. And he was mistaken as to the others. He found that the dandified Poodle could fight, and that the Bulldog had not lost the knack of not lettinggo, and that Russia, after all, was a Rusher, and soon the Bear idea made the Dachshund tremble. And even the little Servian gave the Austrian Mongrel some nasty bites, and so did a neighbour of his named Monty. The Dachshund now began to look round for friends, but they seemed strangely scarce. He had relied on an Italian Greyhound, a thoroughbred, named Italia, but Italia dissembled her love in the strangest way, and asserted that War was a luxury which she could not afford just now. All the same Italia loaded her gun, and who knows but what it may go off and whom it may go off and, whom it may hit -- for accidents will happen in the best regulated families. The Dachshund, to his annoyance, found only one friend, and that was a dog of Constantinople. The Dogs of Constantinople are quite well known for being fond of offal. Meanwhile the rest of the European Happy Family looked on, and who shall say how the row will spread? There's the Greek with his knife ready to take a slice of Turkey; there are the Balkans determined not to be baulked of their own little ambtions; there's the Spaniard fond of Bull fighting so long as he is not a John Bull; there's the Portugee just spoiling for a scrap; there's the Swiss suffering from cold feet; there's the Dutchman, who keeps smiling with difficulty -- still some nice meaty bones may come his way, and in any event he may be relied upon to play the game and not to be a Double Dutchman. [ANOTHER NOTE FOR THE IGNORANT:-- Holland used to be known as a low lying country, but this title has now been filched by Germany] And, up North, the Norwegian, the Swede, and the great Dane all have their eyes well skinned. All this, and more, may be seen depicted above. Search well and you may find many things. But not Peace. Peace has gone to the Dogs for the present -- until a satisfactory muzzle has been found for that Dachshund. Meanwhile the Dachshund's heart bleeds for Belgium -- and his nose for Great Britain." "Of great collecting value! 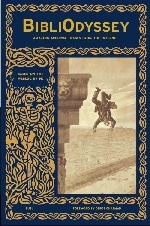 European revue. Kill that eagle. 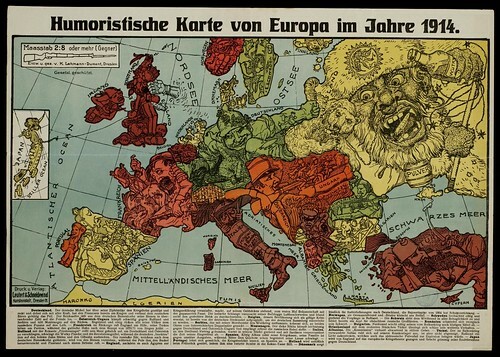 [..] This satirical map of Europe is 'a document proving the perfidy of Albion'. Whilst German assets and blood fight for the fatherland, England regards the war merely as business by saying sneeringly: 'Business as usual' [..]. The map reproduces the English original exactly. The few words are transposed into German for better understanding. The price of this map in London is 1 shilling - 1 mark. Reproduced by a German printer without kind permission from our English cousin, as an eternal memento. Printer and Publisher W. Nölting, Kaiser Wilhelmstr. 93. HAMBURG 36." Austria-Hungary fights cunningly against Russia and Serbia and kicks Montenegro in the back. With enthusiasm and unity, all its peoples go after the Russian bogeyman. France in retreat calls to England for help, its Turkos (?) ask for pardon, while the Gallic rooster crows about victories according to the recipe from 1870/71. Russia with an “Angel of Peace” cockade gruesomely opens its maw to swallow Germany and Austria whole, swings the Vodka bottle and the whip of revolution, while the German “insects” probe his hollow tooth and knock out his poisonous fang. The Russian bear, eager for the German beehive, is driven off by the bees, while the Pole sticks it to him, and Finland calls for a liberator. England, having caused Egypt to declare war as well, makes its first acquaintance with the gauntlet (lit. : armored fist) while standing on its bags of money. The Indian snake gives its bulldog breathing difficulties, and Ireland tries to sever the twisted cord. Belgium, whose people shows itself to be a poisonous toad, has already been skewered on the German fixing pin in order to be incorporated into the German collection. Serbia, which ignited the world war with its murder-bomb, is hunched over caught by both ears by the Austrian double-eagle. Montenegro. The fat Nikita foolishly fights against Germany and Austria-Hungary and jubilantly receives Russian rubles for his effort. Italy, bound by the Triple Alliance, waits in his boot for the moment to intervene, armed and provided with sardines. Spain. King Alfonse counts his war chest, his family is against unnecessary expenses, while the knight Don Quixote already raises his lance. Portugal leans comfortably against Spain while reading the war reports. Denmark peacefully makes butter deliveries to German, the bayonet point of 1864 has been made safe. Norway, as a friend and brother of Germans, applauds us. Sweden watches developments in Russia closely and in arms. Switzerland watches the world conflagration in all comfort and is already an asylum for homeless Russian grand dukes. Rumania energetically forges its sword. Bulgaria. Ferdinand busily washes his saber, still bloody from the Balkan War. Greece, with its conquered bit of Turkey, cleverly considers its next action. Albania. The “Commission” persists in waiting in quiet prayer. Turkey. The sultan, wounded in the Balkan War, is recovering on his sickbed, but is not averse to giving Russia a light, which would cause the south-Russian powder keg to explode. Japan is dragged into the European theater of war by England and grimly bares his predator’s teeth to Germany. England hides its fleet under the skirt of home, the dog Ireland is at its back. King Oskar of Sweden looks “intently” at Russia. German and Austria-Hungary strike solid German blows on all sides. Good “will” prevails in Switzerland. Sicily – volcanic soil, but otherwise quite quiet. Montenegro – a pack of lice. Serbia – a pack of swine! The King of Derazzo. Albania – abandons its people. Greece and Turkey are eager to devour one another. Ferdinand of Bulgaria would also like to have a share. Russia wants to swallow up everything, but will not succeed. The Russian bear sprays insect repellant on the Russians and holds out his empty wallet while roaring “hunger.” Finland, chained to Russia, tries to cut itself free. The Russian is under fire from Austria and Germany. His (chamber)pot is full of victories. His uniform shows a tear in East Prussia and Lithuania. The Austrian duly scratches the Serbs. Rumania is at the ready. Bulgaria is still wounded from the Balkan War. The Turk awakes, he looks at his harem woman. Norway and Sweden are neutral, Denmark supplies butter. Italy has both feet in one boot and remains neutral. The German pushes Belgium out of the way with the elbow and is at Franzi’s head. Bordeaux becomes an asylum for the homeless. The victories of the English and French are false, like the snakes that proclaim them. The Englishman will also soon know what 42ers are, etc. etc. 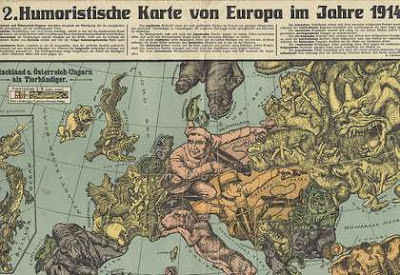 The emergence of modern nation states (such as Germany and Italy) following the mid-19th century revolutions in Europe provided geopolitical material for satirical illustrators to exploit. 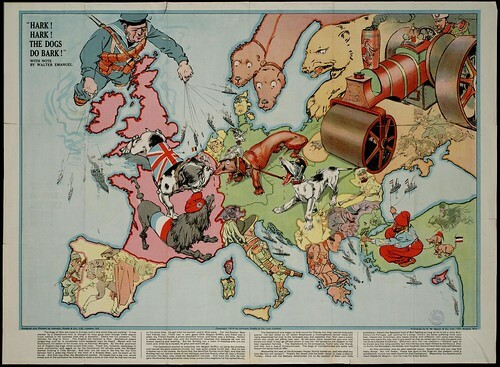 Maps that featured regional stereotypes, animals and assorted symbolic imagery and mythical and historic figures associated with particular countries became a popular vehicle in which prejudices, humour and political commentary could be assembled in a visual format. 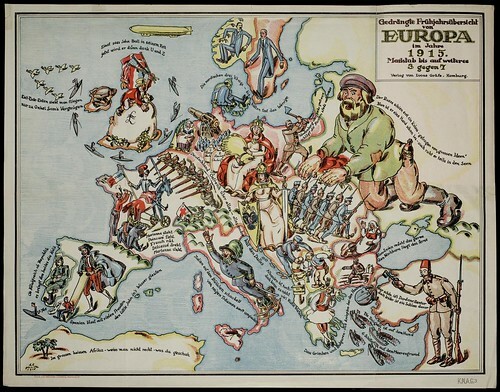 The rise of the serio-comic map caricature genre, that had really begun in about 1870 (although the roots of the tradition stretch back at least to Munster's 'Geographica'** from the mid-1500s), reached its peak of popularity at the beginning of World War One. 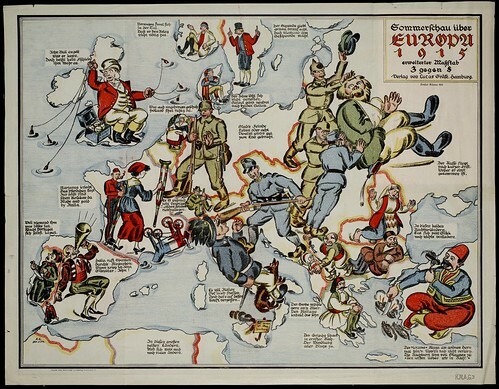 The humorous propaganda maps stirred nationalistic fervour, mocked and belittled enemies and even served as a mnemonic tool for students to learn their geography. 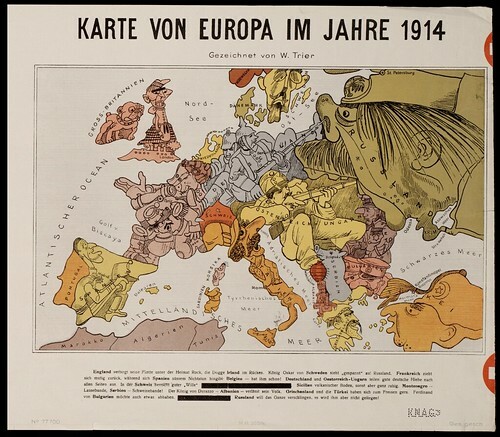 In many of the above maps you can see that the more distorted or grotesque depictions are saved for the least favoured nations while the home side is of course rendered as normal or heroic. The style declined in popularity as the war dragged on and film and posters became the more dominant media of propaganda. 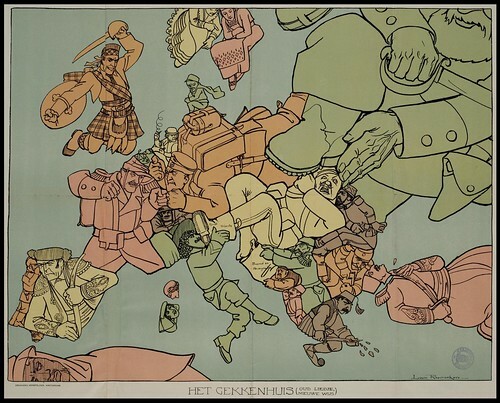 "As early as 1910, German caricature, influential amidst a flowering satirical press, took note of raising international tensions. With the start of hostilities in 1914, the satirical press threw its full weight behind the German war effort and in aid of a fatherland under threat. 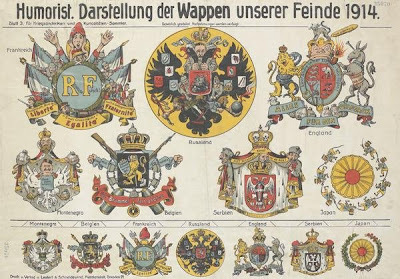 Even pens that had been known for their criticism of the government followed the call by Emperor Wilhelm II for a “holy union”, and depicted the war as a defence of German culture against the onslaught of barbarism. In their initial enthusiasm, they promoted the image of a ridiculous, incompetent, rude and cruel enemy that would almost instantly disintegrate. 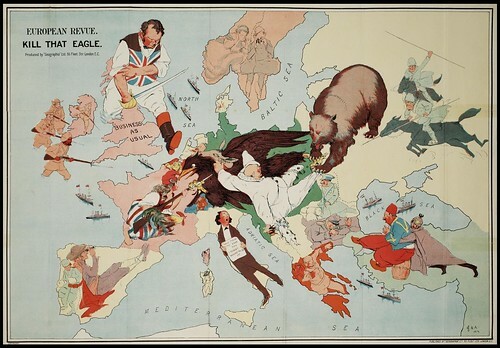 Russia, and to a lesser degree England, is the target of its most scathing insults; France is pictured as following the others’ lead and sometimes even as a victim of her alliances. As the war wears on, less committed caricaturists resort to justificatory sketches, little or not at all satirical, and neither of mobilising nor inciting character, or they turn towards a inconsequential satire of cultural mores. Conservative artists continue to churn out virulently partisan material, while liberal and socialist artists, hoping for peace even while they continue to support the German war effort, introduce new characters, such as the war profiteers and the French soldier, the “Poilu”, depicted with a certain respect." Thanks very much to John D from Yale for translating the German captions!! For the Japanese (or perhaps dissident Chinese) version of the WWI satirical map, see: Asia on the World from a couple of months ago - there are links in this post to more satirical maps. Just as a technical note: The images above are by far the most difficult I've ever put together: the magnification has a habit of changing ever so slightly as the print is moved around the grid in the zoom interface. So, although it won't be noticeable I'm sure, even with side-by-side comparison, the above images have very minor 'modifications' to their appearance; for instance a hand might be a tiny bit larger or smaller: that sort of thing. But the splices themselves remain invisible and nothing of importance has been disturbed. 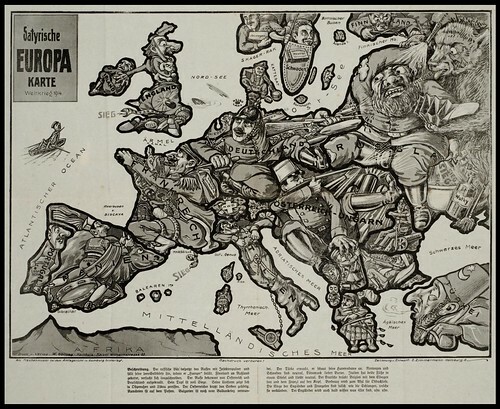 UPDATE: See the later follow up post to this that deals with the late 18th and 19th century development of the caricature map: Satirical Maps. I hope I'm a fairly tolerant person. 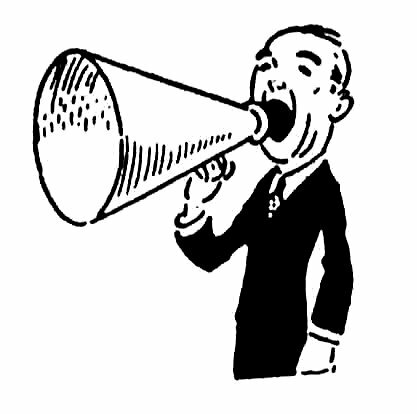 But my patience for people who comment and add a link to their own site without really saying anything much is juuuussssttt about at an end. So, sorry 'Captain', whoever you are, but your comment was deleted for being generally off-topic. Wow, these are fascinating! The Zimmerman map is my favorite. I'm inspired to try this concept myself. Great work on the maps as well as the site. There's tons to look at. Thanks so much. These are fantastic! Thanks for collecting and posting! Great post as usual, and great maps! I couldn't improve on your post, but do you mind if I use one of the maps on my blog, and refer to yours for the others? Very neat. This makes me wonder what our current military excursions would look like if conceived in like fashion. I have this imagined belief that there are armies of moleskine sketchers out there feverishly creating witty anthropomorphic and symbolic modern geopolitical drawings to be launched in googlemaps mashups, flickr sets and illustrationfriday contests in the very near future. hey... are any of these up as prints... how can i purchase some/ all of these? Avira, I had to watch that little gif display about 10 times before I *got* any sense of a body. No disrespect intended, but that's about the worst version of the map abstraction process (for want of a better term) that I think I've seen. Seems fairly obvious that the idea (and morelike: allegorical religious superiority trope) -- human body having been modelled on the shape of Israel -- came before the geoapproximation of the body parts. I can't believe you can look at a map of Israel and just *see* that abstracted form jumping out at you. But thanks anyway, it's an interesting sideline meander. Well sharpey, I suggest you start with 'world war one' at wikipedia and look for references to Holland. Wonderful maps. We are starting a special map section soon (Google map mashups plus articles on cartography) and I'd love to feature something about these images there, with your permission. It could either be on our main website or on our blog, but I'll be contact with you again when its up and running. In the meantime, well done! What a beautiful collection, thankyou! Really, really nice to see this overview. I graduated on the topic of cartoon maps last year and share your fascination! FYI, in case you're interested: I will be delivering a paper on this topic at the International Conference of the History of Cartography (July 2009, Copenhagen). But I suggest reading through this post thoroughly first because I think the answer(s) you seek are readily available. These images are great. I had my HS students view them when we discuss WWI and they are completely engrossed with the images. They raised some great questions which led to a greater understanding of the issue in Europe at the time. Thank you. Amazing! I really enjoyed seeing these. Thanks for digging them out and posting. As a borzoi owner I have to admit my disappointment at finding Russia always represented by a bear in the dog fights. In fact, I just had something of a flashback, the vision of one of my borzois holding a terrified and chastened dachshund in her mouth! The dachshund mounted a suicide attack on me and my six, count them, six, leashed borzois (Russian Wolfhounds)as we walked down the street. That's a German for ya, huh? There was no war of attrition in the trenches. Unconditional surrender in less than 30 seconds. BRAVO - magnificent stuff and thanks for putting it out there! the blank, Romania: King Carol I. Thanks for that history_girl1013; I've added a note in the translation below the image. A great post, and wonderful images. I see they were taken from the University of Amsterdam website - do you have idea what licence the images are under? I don't speak Dutch so am struggling to find a copyright statement on their website. If they are under CC-BY-NC-SA or anything more open we would love to invite you to contribute a blog post to a new resource at the University of Oxford http://ww1centenary.oucs.ox.ac.uk.